I think it has more to do with being a professional organizer. I love organization. I’m calmer when my life and things are in order. When I write articles and general correspondence, I want them to be perfect because I feel it’s a reflection of who I am. Is that bad? And who’s to say it is or isn’t? Do you hold yourself to high standards for everything? What if inflexible standards are slowing you down and holding you back? 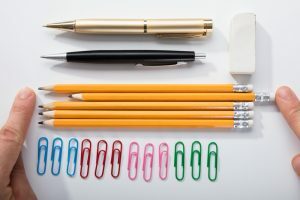 There is such a thing as being an unhealthy perfectionist – trying to reach high standards of excellence vs. the inability to achieve unrealistic expectations of perfection. More often than not, continual high standards aren’t needed to succeed in life. Think about people like Einstein, Oprah, Walt Disney and Bill Gates. These famously accomplished people have reported that they owe their achievements to their unstoppable nature and willingness to make mistakes. There’s evidence that constant perfectionism can get in the way of a happy and productive life. It’s connected to procrastination, low productivity and depression. The trick is to recognize when high standards are necessary and when they actually get in the way of innovation, productivity and fulfillment. Getting to the place of good enough on most tasks and projects allows us to accomplish more without compromising quality. This open-minded approach allows for creativity, innovation and fun. Breathe. Open your mind. Think flexibly about your project or task and let your standards relax. Try the “good enough” approach for your day-to-day tasks and reserve your high standards for when it truly matters. You’ll not only get more done, you’ll also feel motivated to do more. You’ll feel freer and save time that can be spent doing other things. Like organizing your pantry. I’m going to give it a try. Hey fellow perfectionists, are you with me? previous post: How Well Do You Maintain Life Balance? next post: What Causes You Stress?